Remember that dummy prototype ereader Boeye showed off at Frankfurt Book Fair, the one with a 10.3" E-ink screen? That screen has now shown up in a second device. 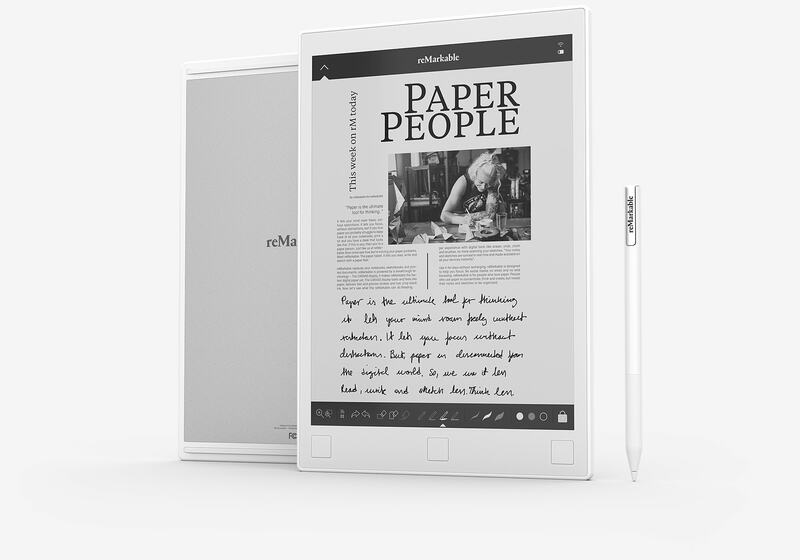 The Remarkable purports to be the "paper tablet for people who prefer paper" but is at this time more marketing hype than a real product, and is being developed by a company which has more marketing people than engineers. According to the marketing materials, this writing slate has a screen which is the most paper-like and quickest digital paper around, but what with no one having seen it yet we do not know that is the case. This writing slate runs a proprietary Linux OS on a 1GHz CPU with 512MB RAM and 8GB of internal storage. That CPU is powering a 10.3" Carta E-ink display (1872 x 1404 resolution - 226 PPI). The Remarkable doesn't have a frontlight, but the spec sheet does mention that there's no glass in the display. It also comes with a multi-point capacitive touchscreen and a custom stylus which has a special high-friction pen tip, can measure how it is being tilted, and is capable of detecting up to 2048 degrees of pressure. In a way, the Remarkable reminds me of the Noteslate. Both devices are writing slates with stylus, both launched with bold claims, and neither passes the sniff test. The Noteslate first launched close to six years ago, but has never shipped a single device and keeps getting delayed. The Noteslate is basically vaporware at this point, while the Remarkable only exists as marketing hype which sounds funny to my expert ear. Electronic Digital Paper displays consists of tens of different layers. On the reMarkable some of these layers are based on E-Ink Carta display technology. In addition we have developed additional layers and technology, including the screen surface, to give it the paper friction. That's the kind of nonsense you get from a marketing guy who doesn't know what he is talking about, and it makes me doubt that the company has a real product or the engineering talent required to bring new screen tech to market. That suspicion is born out by the employees I found on LinkedIn. There's a whole lot of marketing people at Remarkable, but hardly any engineers. That is not reassuring. I would not order one of these tablets, but if you want to take the plunge you can get in on the pre-orders. The Remarkable is scheduled to ship in August 2017. It is currently selling for $379 and comes with a case and the stylus. Danger, Will Robinson! No WAY I’d trust someone else with my work. That was one reason I ditched the Freewrite. Sorry, no go. Geez, at this rate, I’ll have to make my own! What’s the right way to hold a pen? See here. It’s important because it really affects your speed. I’ve schooled the kids to take notes by writing rather than typing because facts don’t sink in as well when you type. Writing is better for mental data retention. That’s how I have always held a pencil, thanks. I had to watch the video closely to see what you meant about holding it wrong. I don’t know, the video looks quite real, it seems that they do have something that actually works. Whether it ever gets beyond prototypes is another thing (probably not). For one thing I am happy that another company is interested in producing a bigger e-ink device. This part of the market was neglected and overlooked for too much time. It makes me happy that, although slowly, companies like Onyx, Sony (supposedly working on new version of DPT-S1), Boeye, GoodEreader (not sure if this is a company) and others are investing in over 10 inches devices. Personally I finally would like to see an ereder with the IMX7 processor that supposedly is a breaktrought when it comes to ghosting and refresh rate. I would love to see it in a device like Dasung’s Paperlike. Nate, do you know if Dasung is working on the 3rd-gen device? At least it looks like there’s really a new display in the playground. Google should make their own digital paper if they want to do something for the planet. More than that, anyone knows any device with an IMX7? | Also, how can the stylus detect the degree of tilt without power? There’s the how, but whether Remarkable ever materializes in its advertised form remains to be seen. I have to wonder about impact on the tablet’s battery life when the stylus is active. Thanks a lot for the news. The lack of Android is a big miss. Android adds functionality. I presume the software and digitizer is better, but still it looks an awful lot like the iRex DR1000 launched back in 2008. That’s 8 years ago. It used a Wacom digitizer with passive pens. Warcom claimed it to be ‘pressure sensitive’ and registering tilt, albeit not very accurate back then. Six of the eight employees I can find have master degrees from Norwegian University of Science and Technology. The company was registered this summer and has a share capital of NOK 1619496 ($191216). It seems to be a continuation of a company called The Magma Company which was owned by the CEO and probably his father. I assume the reMarkable pad is put together mostly from technologies invented elsewhere, and with one or two twists they have invented themselves. It looks to me to be an honest attempt to bring the product to market, which of course doesn’t equals success. And I have a Comp Sci degree from an accredited university. That doesn’t make me a great software engineer. The other problem with citing their degrees is that it shows just how little experience they really have. That is a strike against them, not a point in their favor. It looks a lot like the Sony Digital Paper product from around 2014; even some similar screen examples.